WATCH FOR MOTORCYCLES - May is Motorcycle Awareness Month | Hupy and Abraham, S.C.
May starts the riding season for many and is the traditional month for motorcycle awareness proclamations. 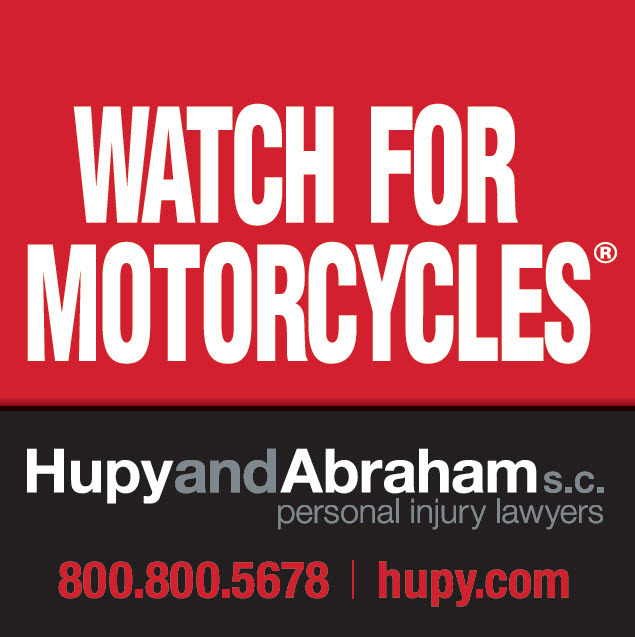 Millions and millions of motorists will view the Hupy and Abraham, S.C. message, “Watch for Motorcycles,” as part of the firm’s continuing billboard campaign in Wisconsin, Illinois and Iowa aimed at reminding motorists that motorcycles are back on the roads. Preventing crashes from occurring is 100 percent effective in reducing injuries and fatalities. Hupy and Abraham, S.C. has spent tens of thousands of dollars on awareness campaigns including billboards, TV public service announcements, contributions to ABATE’s Share the Road programs and distribution of free “Watch For Motorcycles” and “DNT TXT N DRV” bumper stickers. You can help spread the message by ordering and displaying these stickers. Scroll through all of our options and choose your FREE "Watch for Motorcycles" sticker here!